Perfectly Created Chaos! 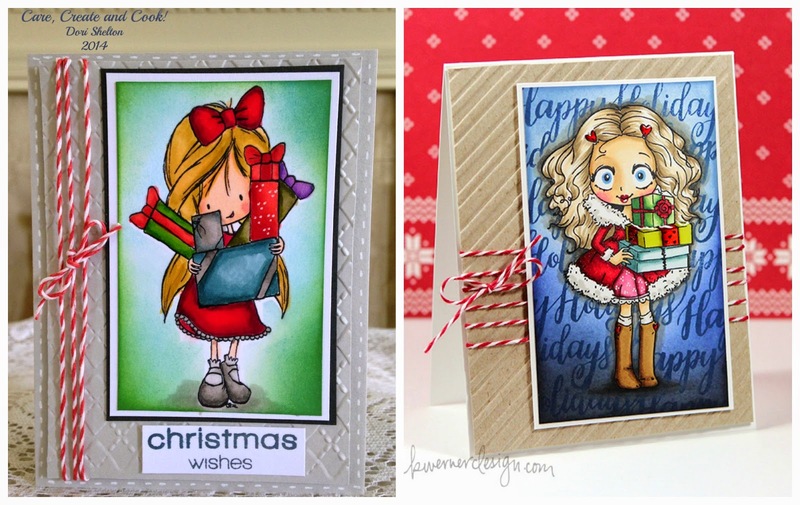 : 25 Days of Christmas Cards: Day 8 "Christmas Wishes"
25 Days of Christmas Cards: Day 8 "Christmas Wishes"
Today's card features lots of Copic coloring. Now, when it comes to copics, I have a very limited supply so I have to sometimes be creative in color combinations and do the best I can when it comes to shading etc. I love copics and the effect you get when using them; but gosh, I sure do hate how expensive they are! Once again, I didn't have the same image Kristina did; but I found this digital image "Birthday Wyn" from Tiddly Inks and thought it made a fine substitution. This was also another "masking project" I printed two copies of the digital image. One onto Neenah White Solar card stock and one on regular computer paper to cut for the mask. I colored the image and then masked it so I could do the background by blending Tumbled Glass and Mowed Lawn distress inks. I also added some W3 and W5 copics under her shoes to give her some "ground" to stand on. 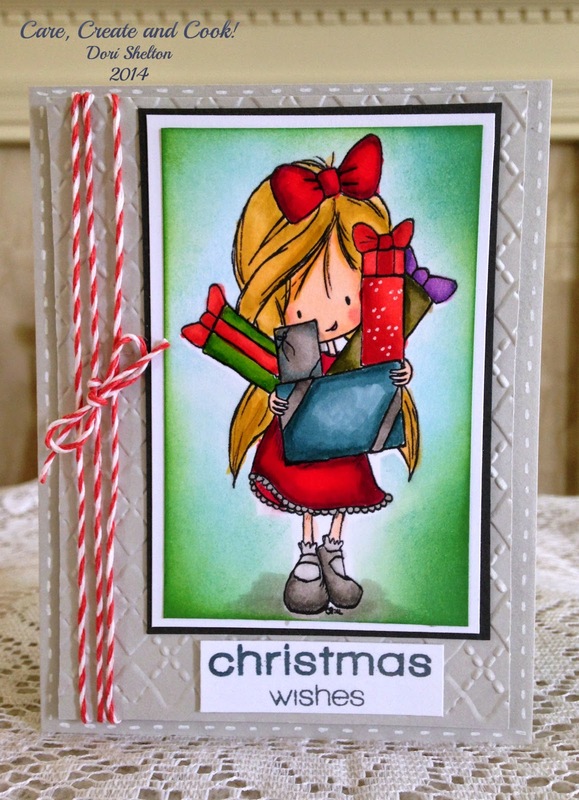 The card base is Fog from Simon Says Stamp; and the sentiment is also from SSS. I embossed the background panel with the Argyle embossing folder and wrapped it with some baker's twine; and adhered the entire panel with foam dimensional to the card base. Finally, and even though it's hard to see in the picture, I did add some clear Wink of Stella glitter pen to the presents. As always, I close the post with the side by side of my card and Kristina's. Let me know what you think! Have a great day, thanks for visiting with me, and I'll see you tomorrow for Day 9! Challenges: Just a few for today! Hiya! It's another fabulous card in its own right, hun! Gorgeous colouring on your cute image! Thanks for joining in at Craft Challenge! you color in a perfect way! !